A perimeter of orange cones warns of the grave sidewalk dangers afoot on a corner in the Crestview/Tupperware Heights neighborhood. 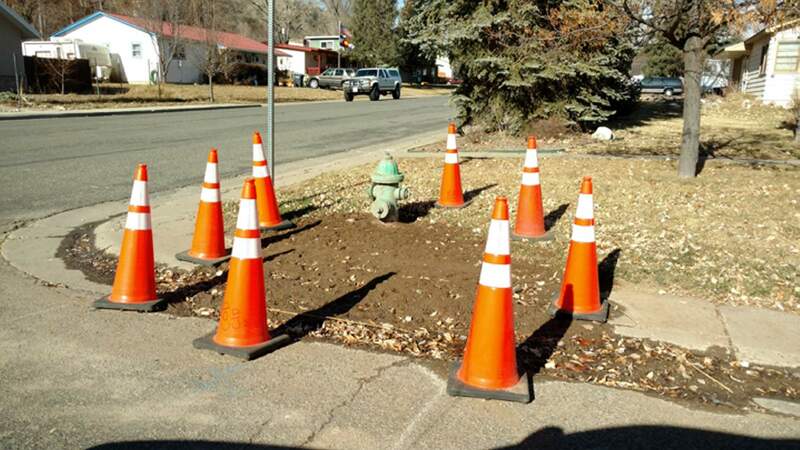 You know a city is serious about safety when a torn-up sidewalk or leaky fire hydrant requires a protective perimeter of no fewer than eight orange cones. This brings up a Very Important Question. In any case, they say that Action Line should answer the question. So we’ll play it safe and turn the city’s risk manager and safety officer. He’s our good friend Jerry Harms. Jerry deals with falls, crunched fleet vehicles and stuff that gets wrecked, mostly involving city personnel and city property. However, Jerry is also the liaison for claims that people file against the city. “We don’t get a ton of these, which is a good thing,” Jerry said, pointing out that the city is self-insured. Over the past six years, the number of “accidents investigated” ranged from a low of 66 in 2014 to a high of 88, the estimated total for 2017. But that doesn’t tell the whole story. The city’s 2017 insurance expenses are below projections, with claims paid trending 2 percent lower, vehicle mishaps down 7 percent and property-damage accidents 23 percent lower. So the city seems to be a relatively safe place. Your home, on the other hand, is the true threat to your well-being. According to the National Safety County, one in 16 Americans will suffer an unintentional injury in the home that requires professional medical aid. Officially, it’s 20.7 million injury accidents nationwide. Locally, the accident total should be 1,156 – if Durango were average. Not that so many locals could be hurt at home. It’s the mere whisper that Durango could be “average.” Oh, the blasphemy! Our entire economy is based on being well above average. Just look at food prices, real estate, the ratio of Patagonia jackets worn and the fact that a decent beer costs 8 bucks. Everything about Durango is above average. Except for wages. But that’s another story. Meanwhile, back at Cone Corner in Durango’s vaunted Tupperware Heights, the current safety situation should be elevated to a Yellow Alert. You see, it’s been a month since “Capt. Safety” took the cone photo. So Action Line performed a weekend inspection to see if anything had changed. There are now six safety cones, not eight. Knowing the riffraff inhabiting the Crestview neighborhood, the cones were pinched by some nefarious T-ball coach or a soccer mom desperate to score an easy goal-post marker. HHHLast week’s column on Fake Math with paper products had its own calumnious calculations. Therefore, we’ll start the New Year with a bounty, so to speak, in the Mea Culpa Mailbag. Action Line reported on the widely disparate prices of toilet paper and paper towels, comparing costs per square foot, as listed on in-store tags. But the prices weren’t “$” as reported. The labels had this tiny “c” in the corner. So the prices were “non-cents,” as loyal reader John Parker points out. Meanwhile, Action Line will make it his No. 2 priority to read toilet paper’s fine print. Thanks to mathematical minders Doug Ramsey, Cliff Hathaway, Van Butler and Travis Ward, who was on a roll. “Since a square foot of TP is about nine squares, that makes premium Charmin Ultra Soft at $4.86/sf cost about $2 a wipe. Wow, I’m switching to leaves,” Travis wrote. Email questions to actionline@durangoherald.com or mail them to Action Line, The Durango Herald, 1275 Main Ave., Durango, CO 81301. You can request anonymity if your New Year’s Eve was awesome: a quiet night at home and falling asleep before 10 p.m.